The most popular Zambian-produced adverts, meant to persuade us to buy Zambian products today, are often senseless and bordering on the absurd. Whether this is true the world over or only here in Zambia, I do not know. But certainly the adverts that I have been seeing on television of late have left much to be desired. They seem to suggest that we Zambians are all idiots! An advert of Herve Renard with his "magic" white shirt--thanks to Boom! To begin with there is the lack of relationship between what is being advertised and the claimed benefit of using it. 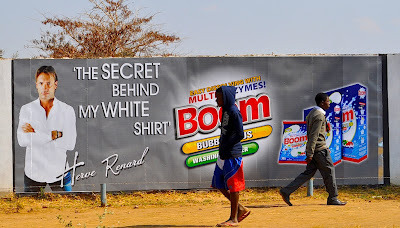 For instance, look at the advert where Jeff Sitali is claiming that Herve Renard (our national football team coach) was successful in coaching the Zambian team into Africa’s number one team because of his “magic” white shirt, which is only made possible because he uses Boom washing powder. There is sheer mindlessness in so many of the adverts. I think here of a paint advert on ZNBC TV where all we are shown is a guy with a hoarse voice dancing with a bucket of paint. I am not being told what the superior quality of this paint is. So, am I being expected to prefer this paint over others because someone danced with it? Or am I being told that I will dance like that if I use this paint? What also worries me is the blatant lying. Look at the television advert where Christopher Katongo (our national football team captain) is claiming he uses MAQ products for his laundry detergents, his bathing soap, and his body lotions. He is being paid to tell a lie. He knows that it is not true, but he goes in front of the whole nation and blatantly lies to us. Why are we allowing this? Granted, there is a grey area in all areas of life, and advertising is no exception. How long should Christopher Katongo use MAQ products before he can say to the nation that he uses them—one week, one month, or one year? There is no such line. However, for a company to come and pay me so that I can claim I use what I do not use—that is a lie. If I have any moral fibre, I should not accept that. Look at Tiger Woods and Nike. Nike's trademark is the famous “swoosh”. Woods simply wears that symbol on his clothes—and they pay him millions of dollars for doing that. He does not need to tell us lies that the swoosh is the “magic” or secret of his success. The secret of his success is talent, hard work, and practice on the field. Even an idiot knows that! The United Kingdom has what is called the Advertising Standards Authority (ASA), which is a watchdog that prevents what has become a senseless “free for all” here in Zambia. One of its rules is that adverts must not exaggerate facts. Recently the ASA in the United Kingdom banned an advert because it had exaggerated the effect of using L’Oreal brand anti-aging cosmetics on the famous actor Julia Roberts. That is how such watchdogs should function. 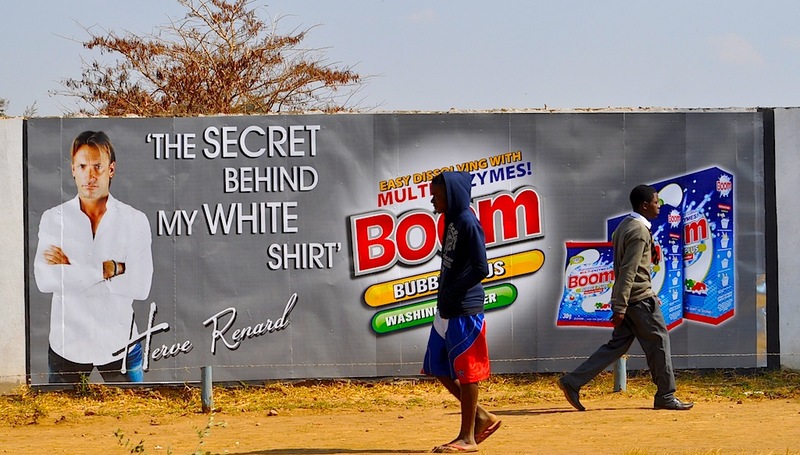 Doesn’t the Zambian Marketers Association or Chamber of Commerce have some rules about advertising? Surely, although there are some grey areas, which will be exploited by those wanting to make quick bucks, an active watchdog should ensure that these adverts that insult our intelligence come to an end! “Did anyone touch it before you did? They could be after your job, son!” ha ha ha I almost fell over with laughter! But on a serious note we need an Advertising Ethics Council. Most of the adverts we see on TV are simply ridiculous! Pastor I have also been bothered by such magical lies. Here adverts thrive on phrases like , best,biggest,first even with no effort to improve the product. We buy lies and are disappointed with the products. Why are we not sending out African missionaries?